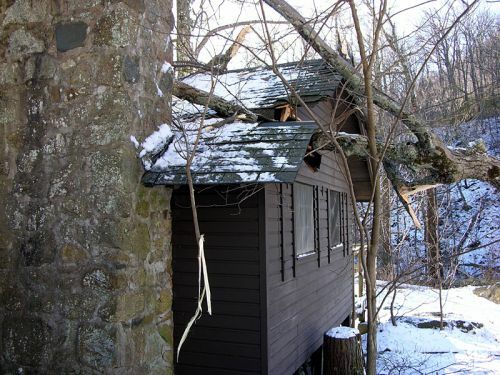 Over the weekend of January 14-15, 2006, a major windstorm came through the Shenandoah mountains, knocking down many trees. 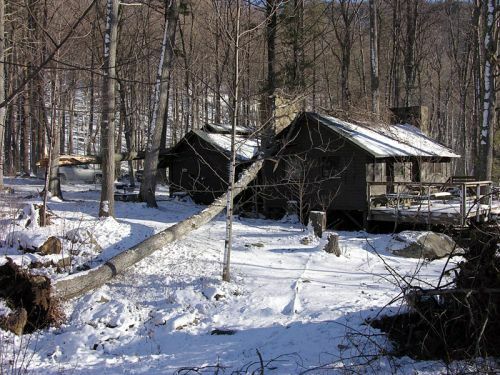 Two of those trees fell onto Cabin 2. Non-member Dean Morgan was staying at camp, and reported " The wind was unbelievable though for about 24 hours straight. There were trees coming down everywhere. It was so bad that being outside at all seemed very risky. 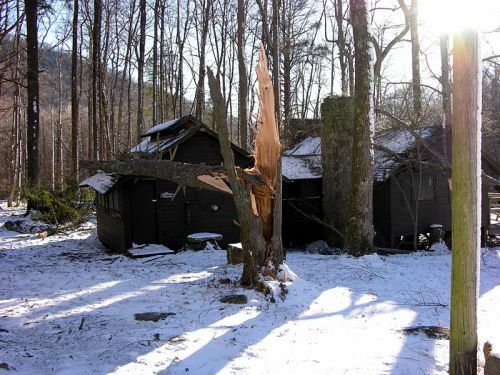 Unfortunately two good sized trees hit Cabin 2. The first one to hit was a Hemlock and hit just above the door over the kitchen. The second one (maybe a Cherry?) hit just inside the chimney in the main room. Another Hemlock up-rooted and came down into the creek without hitting anything. The power went out at about 10:30 or so on Saturday night and was still out when we left camp at about 10:00am on Sunday." 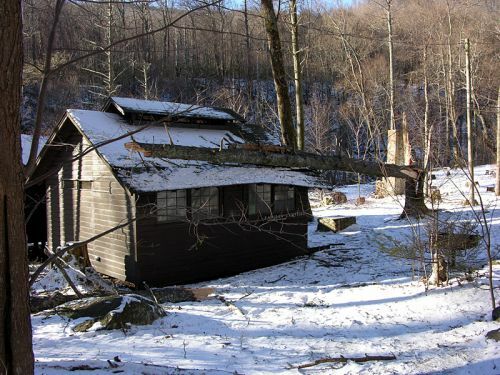 Camp Vice-President Tony Allen coordinated the installation of temporary patches on the roof and the removal of the downed trunks. Preliminary estimates for repairs range from $6,000 to $8,000. We have submitted a claim to our insurance firm. These photos were taken by Dean Morgan.